In the past, orthopedic surgeons made long incisions to open up the shoulder and fix the damage. Now we can do most of these surgeries through small incisions with a scope. Arthroscopic shoulder surgeries are some of the most common surgeries in orthopedics. Orthopedic surgeons perform roughly 1.4 million shoulder arthroscopies each year. This article offers an explanation of these procedures. I discuss the types of injuries that can be treated arthroscopically, and I briefly cover what patients can expect after arthroscopic shoulder surgery. Arthroscopy is a less invasive approach to damage within the shoulder than the traditional open surgery. The surgeon makes two to four small incisions in the shoulder and looks inside with a small scope. The surgeon can see most structures within the shoulder. He can then use small instruments and implants placed through the incisions to treat many injuries. Many damaged structures can be treated arthroscopically. Rotator cuff tears, biceps tendon issues, superior labral tears (SLAP tears), shoulder dislocations and instability, injuries of the AC joint and distal clavicle and more can often be addressed through these procedures. 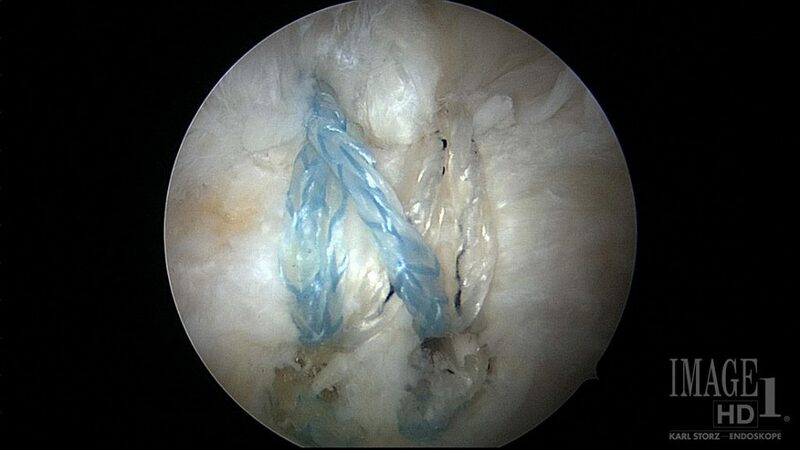 In this arthroscopic image looking from the side of the shoulder, the rotator cuff tendon has now been brought out to its insertion site and reattached with sutures and anchors. Unfortunately, some surgeries still require open incisions. Many fractures around the shoulder and joint replacements are performed with open surgeries. Generally arthroscopic surgeries are less invasive than open ones. The incisions usually are much smaller, usually 1 cm or less. These surgeries still involve difficult recoveries, though. Some procedures still cause significant pain and require long periods after surgery where patients must wear a sling or limit use of the arm. It is important to discuss postoperative instructions with your surgeon, because all surgical procedures are different. Generally, you can get the small incisions wet in a shower within a few days. Often the shoulder swells from the work done to treat the injured structure or from the fluid pumped through the shoulder. The swelling can be uncomfortable. You can use ice or a cold therapy device to try to decrease swelling of the shoulder and arm. Also, physical therapy can be helpful to regain motion and strength of the shoulder and arm after these surgeries. A huge number of shoulder injuries can be treated with a scope now, but they are still significant surgeries. It is important for every patient to ask his surgeon about the nature of his specific procedure and what to expect after it. When is surgery needed for a jersey finger injury? Does the size of a labral tear affect the surgery or recovery?